An hilarious story of How The West Wasn't Won! From the director of Police Academy! 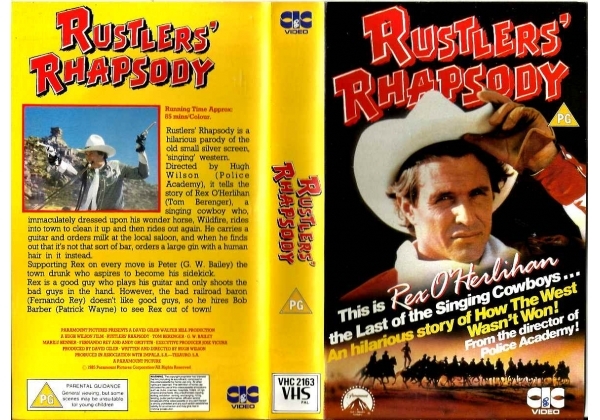 Rustlers' Rhapsody is a hilarious parody of the old small silver screen, 'singing' western. Directed by Hugh Wilson (Police Academy), it tells the story of Rex O' Herlihan (Tom Berenger), a singing cowboy who, immaculately dressed upon his wonder horse, Wildfire, rides into tow to clean it up and then rides out again. He carries a guitar and orders milk at the local saloon, and when he finds out that it's not that sort of bar, orders a large gin with a human hair in it instead. Supporting Rex on every move is Peter (G.W.Bailey) the town drunk who aspires to become his sidekick. Rex is a good guy who plays guitar and only shoots the bad guys in the hand. However, the bad railroad baron (Fernando Rey) doesn't like good guys, so he hires Bob Barber (Patrick Wayne) to see Rex Out of town! © Paramount Pictures and Impala S.A.-Tesauro, S.A.
Or find "Rustlers' Rhapsody" on VHS and DVD / BluRay at Amazon.